The question would be, "Laura, what have you dragged home now?". 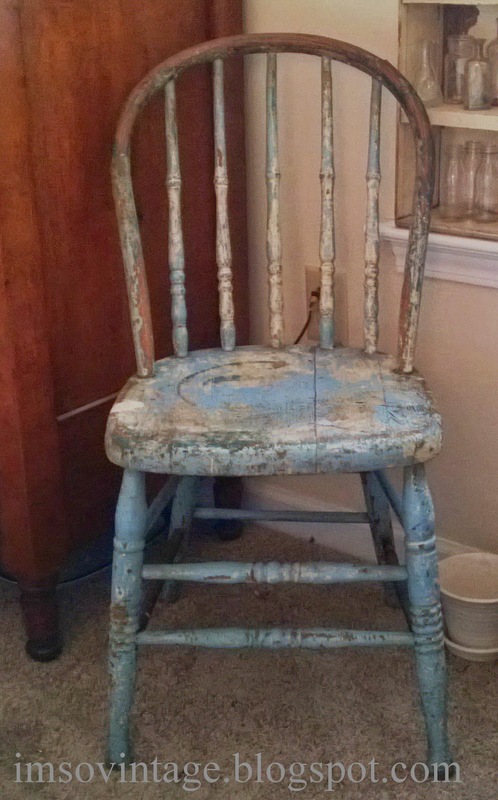 You know me, if it is old, primitive, and has chippy paint I am going to love it. If the chippy paint is blue I am going to love it even more. If it is $1 I am going to be over the moon about it. It was just sitting at a yard sale waiting for me this morning and it was filthy. The lady who was selling it said it had belonged to her husband's grandmother. I think she must have had it sitting next to a coal stove because I have never seen any more black come off of a piece of furniture. But I scrubbed it down and disinfected it and after moving some things around it is in the perfect spot. I added a pillow I made from an old quilt and I am now loving it. In fact, it may be my new best friend. It is a charming chair. So happy it came home with you; the pillow is perfect! I know, Dawn. I was amazed because everything else was overpriced. Oh Laura, it is beautiful! 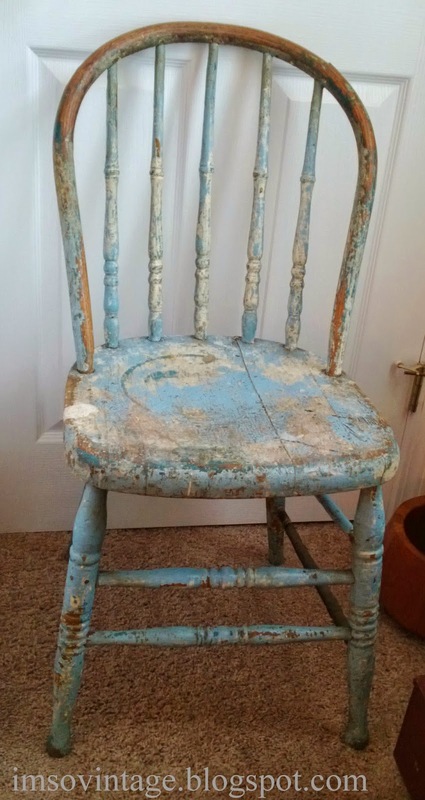 It is perfect and would be even more perfect in a room that I want to refinish. I would have bought it if I had seen it first!!! GREAT find!! It would look very pretty with a plant resting on it too, Laura. In a sweet galvanized bucket perhaps? I love it! I would've snatched it up too. What a deal! What a fabulous find. 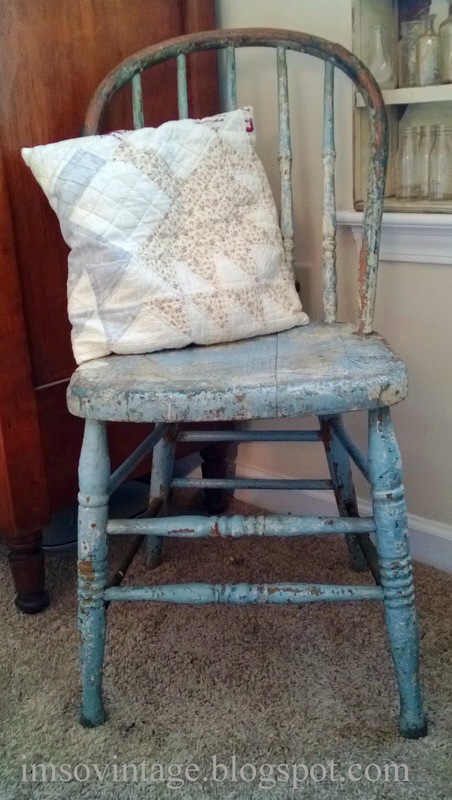 The chippy blue is amazing and the quilt pillow is the perfect sweet touch. Love that - I would have snapped that up in a second too. What you have dragged home now, Laura is a treasure. Happy hunting!! It was just meant to go home with you and be loved! I thought my heart stopped when I saw this chair. Love the style, the blue, the distressed nature of the piece. Perfectly charming and a wonderful addition to your home. I am a chair hound and the older and more beat up the better! I love that chair!